Definition at line 118 of file ScheduleDAGInstrs.h. Definition at line 243 of file ScheduleDAGInstrs.h. A list of SUnits, used in Value2SUsMap, during DAG construction. Note: to gain speed it might be worth investigating an optimized implementation of this data structure, such as a singly linked list with a memory pool (SmallVector was tried but slow and SparseSet is not applicable). Definition at line 189 of file ScheduleDAGInstrs.h. Definition at line 111 of file ScheduleDAGInstrs.cpp. References DbgValues, llvm::MachineFunction::getSubtarget(), llvm::TargetSchedModel::init(), SchedModel, and llvm::ARM_MB::ST. Adds barrier chain edges from all SUs in map, and then clear the map. This is equivalent to insertBarrierChain(), but optimized for the common case where the new BarrierChain (a global memory object) has a higher NodeNum than all SUs in map. It is assumed BarrierChain has been set before calling this. Definition at line 660 of file ScheduleDAGInstrs.cpp. References assert(), BarrierChain, and I. Adds dependencies as needed from all SUs in list to SU. Definition at line 209 of file ScheduleDAGInstrs.h. Referenced by addChainDependencies(), and buildSchedGraph(). Adds dependencies as needed from all SUs in map, to SU. Definition at line 644 of file ScheduleDAGInstrs.cpp. Adds dependencies as needed to SU, from all SUs mapped to V.
Definition at line 651 of file ScheduleDAGInstrs.cpp. References addChainDependencies(), llvm::MapVector< KeyT, ValueT, MapType, VectorType >::end(), llvm::MapVector< KeyT, ValueT, MapType, VectorType >::find(), and llvm::ScheduleDAGInstrs::Value2SUsMap::getTrueMemOrderLatency(). Adds a chain edge between SUa and SUb, but only if both AliasAnalysis and Target fail to deny the dependency. Definition at line 522 of file ScheduleDAGInstrs.cpp. References AAForDep, llvm::SUnit::addPred(), llvm::SUnit::getInstr(), llvm::MachineInstr::mayAlias(), llvm::SDep::MayAliasMem, llvm::SDep::setLatency(), and UseTBAA. Add a DAG edge to the given SU with the given predecessor dependence data. true if the edge may be added without creating a cycle OR if an equivalent edge already existed (false indicates failure). Definition at line 1155 of file ScheduleDAGInstrs.cpp. References llvm::SUnit::addPred(), llvm::ScheduleDAGTopologicalSort::AddPred(), llvm::ScheduleDAG::ExitSU, llvm::SDep::getSUnit(), llvm::SDep::isArtificial(), llvm::ScheduleDAGTopologicalSort::IsReachable(), and Topo. Referenced by llvm::HexagonSubtarget::CallMutation::apply(), llvm::createCopyConstrainDAGMutation(), and fuseInstructionPair(). MO is an operand of SU's instruction that defines a physical register. Adds data dependencies from SU to any uses of the physical register. Definition at line 230 of file ScheduleDAGInstrs.cpp. References llvm::SUnit::addPred(), llvm::SDep::Artificial, assert(), llvm::TargetSchedModel::computeOperandLatency(), llvm::SparseMultiSet< ValueT, KeyFunctorT, SparseT >::contains(), llvm::SDep::Data, llvm::SparseMultiSet< ValueT, KeyFunctorT, SparseT >::end(), llvm::SparseMultiSet< ValueT, KeyFunctorT, SparseT >::find(), llvm::MachineInstr::getDesc(), llvm::SUnit::getInstr(), llvm::MCInstrDesc::getNumOperands(), llvm::MachineInstr::getOperand(), llvm::MachineOperand::getReg(), llvm::MachineFunction::getSubtarget(), llvm::MCInstrDesc::hasImplicitDefOfPhysReg(), llvm::MCInstrDesc::hasImplicitUseOfPhysReg(), llvm::SUnit::hasPhysRegDefs, I, llvm::MachineOperand::isDef(), llvm::MCRegAliasIterator::isValid(), llvm::ScheduleDAG::MF, SchedModel, llvm::SDep::setLatency(), llvm::ARM_MB::ST, llvm::ScheduleDAG::TRI, and Uses. Adds register dependencies (data, anti, and output) from this SUnit to following instructions in the same scheduling region that depend the physical register referenced at OperIdx. Definition at line 285 of file ScheduleDAGInstrs.cpp. References addPhysRegDataDeps(), llvm::SUnit::addPred(), llvm::SDep::Anti, B, llvm::TargetSchedModel::computeOutputLatency(), llvm::SparseMultiSet< ValueT, KeyFunctorT, SparseT >::contains(), Defs, llvm::SparseMultiSet< ValueT, KeyFunctorT, SparseT >::end(), llvm::SparseMultiSet< ValueT, KeyFunctorT, SparseT >::equal_range(), llvm::SparseMultiSet< ValueT, KeyFunctorT, SparseT >::erase(), llvm::SparseMultiSet< ValueT, KeyFunctorT, SparseT >::eraseAll(), llvm::ScheduleDAG::ExitSU, llvm::SparseMultiSet< ValueT, KeyFunctorT, SparseT >::find(), llvm::SUnit::getInstr(), llvm::MachineInstr::getOperand(), llvm::MachineOperand::getReg(), llvm::SUnit::hasPhysRegUses, I, llvm::SparseMultiSet< ValueT, KeyFunctorT, SparseT >::insert(), llvm::SUnit::isCall, llvm::MachineRegisterInfo::isConstantPhysReg(), llvm::MachineOperand::isDead(), llvm::MachineOperand::isDef(), llvm::MachineOperand::isUse(), llvm::MCRegAliasIterator::isValid(), MI, llvm::ScheduleDAG::MRI, llvm::SDep::Output, P, Reg, llvm::MachineInstr::registerDefIsDead(), RemoveKillFlags, SchedModel, llvm::MachineOperand::setIsKill(), llvm::SDep::setLatency(), SubReg, llvm::ScheduleDAG::TRI, and Uses. Adds dependencies from instructions in the current list of instructions being scheduled to scheduling barrier. We want to make sure instructions which define registers that are either used by the terminator or are live-out are properly scheduled. This is especially important when the definition latency of the return value(s) are too high to be hidden by the branch or when the liveout registers used by instructions in the fallthrough block. Definition at line 201 of file ScheduleDAGInstrs.cpp. References addVRegUseDeps(), BB, llvm::SparseMultiSet< ValueT, KeyFunctorT, SparseT >::contains(), llvm::MachineBasicBlock::end(), llvm::ScheduleDAG::ExitSU, llvm::MachineInstr::getOperandNo(), llvm::SparseMultiSet< ValueT, KeyFunctorT, SparseT >::insert(), llvm::MachineInstr::isBarrier(), llvm::MachineInstr::isCall(), llvm::TargetRegisterInfo::isPhysicalRegister(), llvm::TargetRegisterInfo::isVirtualRegister(), llvm::MachineInstr::operands(), Reg, RegionEnd, llvm::SUnit::setInstr(), llvm::MachineBasicBlock::successors(), and Uses. Adds register output and data dependencies from this SUnit to instructions that occur later in the same scheduling region if they read from or write to the virtual register defined at OperIdx. TODO: Hoist loop induction variable increments. This has to be reevaluated. Generally, IV scheduling should be done before coalescing. Definition at line 382 of file ScheduleDAGInstrs.cpp. References llvm::SUnit::addPred(), llvm::TargetSubtargetInfo::adjustSchedDependency(), llvm::LaneBitmask::any(), assert(), llvm::TargetSchedModel::computeOperandLatency(), llvm::TargetSchedModel::computeOutputLatency(), CurrentVRegDefs, CurrentVRegUses, llvm::SDep::Data, E, llvm::SparseMultiSet< ValueT, KeyFunctorT, SparseT >::end(), llvm::SparseMultiSet< ValueT, KeyFunctorT, SparseT >::erase(), llvm::SparseMultiSet< ValueT, KeyFunctorT, SparseT >::find(), llvm::LaneBitmask::getAll(), llvm::SUnit::getInstr(), getLaneMaskForMO(), llvm::MachineInstr::getOperand(), llvm::MachineOperand::getReg(), llvm::MachineOperand::getSubReg(), llvm::MachineFunction::getSubtarget(), llvm::MachineRegisterInfo::hasOneDef(), I, llvm::SparseMultiSet< ValueT, KeyFunctorT, SparseT >::insert(), llvm::MachineOperand::isDead(), llvm::MachineOperand::isUndef(), llvm::make_range(), llvm::ScheduleDAG::MF, MI, llvm::ScheduleDAG::MRI, llvm::SDep::Output, Reg, SchedModel, llvm::MachineOperand::setIsUndef(), llvm::SDep::setLatency(), llvm::ARM_MB::ST, and TrackLaneMasks. Adds a register data dependency if the instruction that defines the virtual register used at OperIdx is mapped to an SUnit. Add a register antidependency from this SUnit to instructions that occur later in the same scheduling region if they write the virtual register. TODO: Handle ExitSU "uses" properly. Definition at line 491 of file ScheduleDAGInstrs.cpp. References llvm::SDep::Anti, CurrentVRegDefs, CurrentVRegUses, llvm::SparseMultiSet< ValueT, KeyFunctorT, SparseT >::end(), llvm::SparseMultiSet< ValueT, KeyFunctorT, SparseT >::find(), llvm::LaneBitmask::getAll(), llvm::SUnit::getInstr(), getLaneMaskForMO(), llvm::MachineInstr::getOperand(), llvm::MachineOperand::getReg(), llvm::SparseMultiSet< ValueT, KeyFunctorT, SparseT >::insert(), llvm::make_range(), MI, Reg, and TrackLaneMasks. Referenced by addSchedBarrierDeps(), and buildSchedGraph(). Definition at line 271 of file ScheduleDAGInstrs.h. Referenced by llvm::createCopyConstrainDAGMutation(), enterRegion(), llvm::GCNScheduleDAGMILive::finalizeSchedule(), llvm::GCNScheduleDAGMILive::schedule(), and llvm::SIScheduleDAGMI::schedule(). If RPTracker is non-null, compute register pressure as a side effect. The DAG builder is an efficient place to do it because it already visits operands. Definition at line 704 of file ScheduleDAGInstrs.cpp. References AAForDep, addBarrierChain(), addChainDependencies(), llvm::PressureDiffs::addInstruction(), addPhysRegDeps(), llvm::SUnit::addPred(), llvm::SUnit::addPredBarrier(), addSchedBarrierDeps(), addVRegDefDeps(), addVRegUseDeps(), llvm::RegisterOperands::adjustLaneLiveness(), llvm::SDep::Artificial, assert(), BarrierChain, CanHandleTerminators, llvm::SparseMultiSet< ValueT, KeyFunctorT, SparseT >::clear(), llvm::ScheduleDAG::clearDAG(), llvm::RegisterOperands::collect(), CurrentVRegDefs, CurrentVRegUses, llvm::dbgs(), DbgValues, Defs, llvm::SparseMultiSet< ValueT, KeyFunctorT, SparseT >::empty(), EnableAASchedMI, llvm::ScheduleDAG::ExitSU, FirstDbgValue, llvm::MachineFunction::getDataLayout(), llvm::LiveIntervals::getInstructionIndex(), llvm::MachineInstr::getNumOperands(), llvm::MCRegisterInfo::getNumRegs(), llvm::MachineRegisterInfo::getNumVirtRegs(), llvm::MachineInstr::getOperand(), llvm::RegPressureTracker::getPos(), getReductionSize(), llvm::MachineOperand::getReg(), llvm::MachineFunction::getSubtarget(), getUnderlyingObjectsForInstr(), HugeRegion, llvm::PressureDiffs::init(), llvm::ScheduleDAGTopologicalSort::InitDAGTopologicalSorting(), initSUnits(), llvm::ScheduleDAGInstrs::Value2SUsMap::insert(), llvm::MachineInstr::isDebugLabel(), llvm::MachineInstr::isDebugValue(), llvm::MachineOperand::isDef(), llvm::MachineInstr::isDereferenceableInvariantLoad(), isGlobalMemoryObject(), llvm::TargetRegisterInfo::isPhysicalRegister(), llvm::MachineInstr::isPosition(), llvm::MachineOperand::isReg(), llvm::MachineInstr::isTerminator(), llvm::MachineOperand::isUse(), llvm::TargetRegisterInfo::isVirtualRegister(), llvm::SUnit::Latency, LLVM_DEBUG, llvm::MachineInstr::mayLoad(), llvm::MachineInstr::mayStore(), llvm::ScheduleDAG::MF, MFI, MI, MISUnitMap, llvm::ScheduleDAG::MRI, llvm::SUnit::NodeNum, llvm::SUnit::NumSuccs, llvm::MachineOperand::readsReg(), llvm::RegPressureTracker::recede(), llvm::RegPressureTracker::recedeSkipDebugValues(), reduceHugeMemNodeMaps(), Reg, RegionBegin, RegionEnd, llvm::SDep::setLatency(), llvm::SparseMultiSet< ValueT, KeyFunctorT, SparseT >::setUniverse(), llvm::ScheduleDAGInstrs::Value2SUsMap::size(), llvm::ARM_MB::ST, llvm::ScheduleDAG::SUnits, Topo, TrackLaneMasks, llvm::ScheduleDAG::TRI, UnknownValue, llvm::TargetSubtargetInfo::useAA(), and Uses. Referenced by llvm::GCNIterativeScheduler::BuildDAG::BuildDAG(), and llvm::DefaultVLIWScheduler::schedule(). True if an edge can be added from PredSU to SuccSU without creating a cycle. Definition at line 1151 of file ScheduleDAGInstrs.cpp. References llvm::ScheduleDAG::ExitSU, llvm::ScheduleDAGTopologicalSort::IsReachable(), and Topo. Definition at line 285 of file ScheduleDAGInstrs.h. Definition at line 1122 of file ScheduleDAGInstrs.cpp. References llvm::ScheduleDAG::dumpNodeAll(), llvm::ScheduleDAG::EntrySU, llvm::ScheduleDAG::ExitSU, llvm::SUnit::getInstr(), and llvm::ScheduleDAG::SUnits. Referenced by llvm::ScheduleDAGInstrs::Value2SUsMap::getTrueMemOrderLatency(), and llvm::VLIWPacketizerList::PacketizeMIs(). Definition at line 1114 of file ScheduleDAGInstrs.cpp. References llvm::dbgs(), llvm::MachineInstr::dump(), llvm::ScheduleDAG::dumpNodeName(), and llvm::SUnit::getInstr(). Referenced by llvm::R600SchedStrategy::pickNode(), llvm::R600SchedStrategy::releaseBottomNode(), llvm::R600SchedStrategy::releaseTopNode(), and llvm::GenericScheduler::reschedulePhysReg(). Definition at line 274 of file ScheduleDAGInstrs.h. Referenced by llvm::ScheduleDAGInstrs::Value2SUsMap::clearList(), llvm::createCopyConstrainDAGMutation(), enterRegion(), llvm::GCNScheduleDAGMILive::finalizeSchedule(), and llvm::GCNScheduleDAGMILive::schedule(). This does not actually create the DAG, only clears it. The scheduling driver may call BuildSchedGraph multiple times per scheduling region. Reimplemented in llvm::ScheduleDAGMILive, llvm::ScheduleDAGMI, and llvm::GCNIterativeScheduler. Definition at line 187 of file ScheduleDAGInstrs.cpp. References assert(), BB, begin(), end(), NumRegionInstrs, RegionBegin, and RegionEnd. Referenced by llvm::ScheduleDAGMI::enterRegion(), getSchedRegions(), INITIALIZE_PASS(), and llvm::VLIWPacketizerList::PacketizeMIs(). Definition at line 197 of file ScheduleDAGInstrs.cpp. Referenced by llvm::GCNScheduleDAGMILive::finalizeSchedule(), getSchedRegions(), INITIALIZE_PASS(), and llvm::VLIWPacketizerList::PacketizeMIs(). Reimplemented in llvm::GCNScheduleDAGMILive, and llvm::GCNIterativeScheduler. Definition at line 332 of file ScheduleDAGInstrs.h. Reimplemented in llvm::ScheduleDAGMI, and llvm::SwingSchedulerDAG. Definition at line 182 of file ScheduleDAGInstrs.cpp. Referenced by llvm::SwingSchedulerDAG::finishBlock(), llvm::ScheduleDAGMI::finishBlock(), getSchedRegions(), INITIALIZE_PASS(), and llvm::VLIWPacketizerList::PacketizeMIs(). Fixes register kill flags that scheduling has made invalid. Definition at line 1062 of file ScheduleDAGInstrs.cpp. References llvm::LivePhysRegs::addLiveOuts(), llvm::dbgs(), llvm::MachineOperand::getReg(), I, llvm::LivePhysRegs::init(), llvm::MachineOperand::isDef(), llvm::MachineOperand::isReg(), llvm::MachineOperand::isRegMask(), LiveRegs, LLVM_DEBUG, llvm::make_range(), MI, llvm::ScheduleDAG::MRI, llvm::RISCVFenceField::O, llvm::printMBBReference(), llvm::MachineBasicBlock::rbegin(), Reg, llvm::LivePhysRegs::removeReg(), llvm::LivePhysRegs::removeRegsInMask(), llvm::MachineBasicBlock::rend(), toggleKills(), and llvm::ScheduleDAG::TRI. Return the basic block label. It is not necessarilly unique because a block contains multiple scheduling regions. But it is fine for visualization. Definition at line 1147 of file ScheduleDAGInstrs.cpp. Returns a label for a DAG node that points to an instruction. Definition at line 1133 of file ScheduleDAGInstrs.cpp. References llvm::ScheduleDAG::EntrySU, llvm::ScheduleDAG::ExitSU, llvm::SUnit::getInstr(), llvm::MachineInstr::print(), and llvm::raw_string_ostream::str(). Returns a mask for which lanes get read/written by the given (register) machine operand. Definition at line 362 of file ScheduleDAGInstrs.cpp. References llvm::LaneBitmask::getAll(), llvm::TargetRegisterClass::getLaneMask(), llvm::MachineOperand::getReg(), llvm::MachineRegisterInfo::getRegClass(), llvm::MachineOperand::getSubReg(), llvm::TargetRegisterInfo::getSubRegIndexLaneMask(), llvm::TargetRegisterClass::HasDisjunctSubRegs, llvm::ScheduleDAG::MRI, Reg, SubReg, and llvm::ScheduleDAG::TRI. Referenced by addVRegDefDeps(), and addVRegUseDeps(). Definition at line 264 of file ScheduleDAGInstrs.h. References llvm::SUnit::getInstr(), llvm::TargetSchedModel::hasInstrSchedModel(), llvm::TargetSchedModel::resolveSchedClass(), and llvm::SUnit::SchedClass. Referenced by llvm::SchedBoundary::bumpNode(), llvm::SchedBoundary::checkHazard(), llvm::SchedRemainder::init(), llvm::GenericSchedulerBase::SchedCandidate::initResourceDelta(), and initSUnits(). Gets the machine model for instruction scheduling. Definition at line 261 of file ScheduleDAGInstrs.h. Referenced by llvm::GenericScheduler::initialize(), and llvm::PostGenericScheduler::initialize(). Returns an existing SUnit for this MI, or nullptr. Definition at line 391 of file ScheduleDAGInstrs.h. Referenced by llvm::createCopyConstrainDAGMutation(), llvm::SMSchedule::finalizeSchedule(), and llvm::SMSchedule::isLoopCarried(). Creates an SUnit for each real instruction, numbered in top-down topological order. The instruction order A < B, implies that no edge exists from B to A.
Map each real instruction to its SUnit. After initSUnits, the SUnits vector cannot be resized and the scheduler may hang onto SUnit pointers. We may relax this in the future by using SUnit IDs instead of pointers. MachineScheduler relies on initSUnits numbering the nodes by their order in the original instruction list. Definition at line 543 of file ScheduleDAGInstrs.cpp. References llvm::MCProcResourceDesc::BufferSize, llvm::SUnit::getInstr(), llvm::TargetSchedModel::getProcResource(), getSchedClass(), llvm::TargetSchedModel::getWriteProcResBegin(), llvm::TargetSchedModel::getWriteProcResEnd(), llvm::TargetSchedModel::hasInstrSchedModel(), llvm::SUnit::hasReservedResource, llvm::SUnit::isCall, llvm::SUnit::isCommutable, llvm::SUnit::isUnbuffered, llvm::SUnit::Latency, llvm::make_range(), MI, MISUnitMap, newSUnit(), NumRegionInstrs, RegionBegin, RegionEnd, llvm::PPCISD::SC, SchedModel, and llvm::ScheduleDAG::SUnits. Inserts a barrier chain in a huge region, far below current SU. Adds barrier chain edges from all SUs in map with higher NodeNums than this new BarrierChain, and remove them from map. It is assumed BarrierChain has been set before calling this. Definition at line 671 of file ScheduleDAGInstrs.cpp. References assert(), BarrierChain, llvm::MapVector< KeyT, ValueT, MapType, VectorType >::begin(), llvm::MapVector< KeyT, ValueT, MapType, VectorType >::end(), I, llvm::SUnit::NodeNum, llvm::ScheduleDAGInstrs::Value2SUsMap::reComputeSize(), and llvm::MapVector< KeyT, ValueT, MapType, VectorType >::remove_if(). Creates a new SUnit and return a ptr to it. Definition at line 380 of file ScheduleDAGInstrs.h. Reduces maps in FIFO order, by N SUs. This is better than turning every Nth memory SU into BarrierChain in buildSchedGraph(), since it avoids unnecessary edges between seen SUs above the new BarrierChain, and those below it. Definition at line 999 of file ScheduleDAGInstrs.cpp. References llvm::SUnit::addPredBarrier(), assert(), BarrierChain, llvm::dbgs(), llvm::ScheduleDAGInstrs::Value2SUsMap::dump(), I, insertBarrierChain(), LLVM_DEBUG, N, llvm::SUnit::NodeNum, llvm::ScheduleDAGInstrs::Value2SUsMap::size(), llvm::sort(), and llvm::ScheduleDAG::SUnits. Orders nodes according to selected style. Typically, a scheduling algorithm will implement schedule() without overriding enterRegion() or exitRegion(). Implemented in llvm::ScheduleDAGMILive, llvm::SIScheduleDAGMI, llvm::ScheduleDAGMI, llvm::SwingSchedulerDAG, llvm::DefaultVLIWScheduler, llvm::GCNScheduleDAGMILive, llvm::VLIWMachineScheduler, and llvm::GCNIterativeScheduler. Definition at line 178 of file ScheduleDAGInstrs.cpp. Referenced by getSchedRegions(), INITIALIZE_PASS(), llvm::VLIWPacketizerList::PacketizeMIs(), and llvm::ScheduleDAGMI::startBlock(). Initializes register live-range state for updating kills. PostRA helper for rewriting kill flags. Toggles a register operand kill flag. Other adjustments may be made to the instruction if necessary. Return true if the operand has been deleted, false if not. Definition at line 176 of file ScheduleDAGInstrs.h. Referenced by addChainDependency(), and buildSchedGraph(). Remember a generic side-effecting instruction as we proceed. No other SU ever gets scheduled around it (except in the special case of a huge region that gets reduced). Definition at line 181 of file ScheduleDAGInstrs.h. Referenced by addBarrierChain(), buildSchedGraph(), insertBarrierChain(), and reduceHugeMemNodeMaps(). Definition at line 144 of file ScheduleDAGInstrs.h. Referenced by addSchedBarrierDeps(), llvm::GCNIterativeScheduler::BuildDAG::BuildDAG(), enterRegion(), finishBlock(), getDAGName(), llvm::GCNIterativeScheduler::OverrideLegacyStrategy::OverrideLegacyStrategy(), llvm::GCNScheduleDAGMILive::schedule(), llvm::GCNIterativeScheduler::scheduleRegion(), and startBlock(). The standard DAG builder does not normally include terminators as DAG nodes because it does not create the necessary dependencies to prevent reordering. A specialized scheduler can override TargetInstrInfo::isSchedulingBoundary then enable this flag to indicate it has taken responsibility for scheduling the terminator correctly. Definition at line 135 of file ScheduleDAGInstrs.h. Referenced by buildSchedGraph(), and llvm::DefaultVLIWScheduler::DefaultVLIWScheduler(). Tracks the last instruction(s) in this region defining each virtual register. There may be multiple current definitions for a register with disjunct lanemasks. Definition at line 172 of file ScheduleDAGInstrs.h. Referenced by addVRegDefDeps(), addVRegUseDeps(), and buildSchedGraph(). Tracks the last instructions in this region using each virtual register. Definition at line 174 of file ScheduleDAGInstrs.h. These are generated by buildSchedGraph but persist so they can be referenced when emitting the final schedule. Definition at line 247 of file ScheduleDAGInstrs.h. Referenced by buildSchedGraph(), llvm::GCNIterativeScheduler::detachSchedule(), and ScheduleDAGInstrs(). Defs, Uses - Remember where defs and uses of each register are as we iterate upward through the instructions. This is allocated here instead of inside BuildSchedGraph to avoid the need for it to be initialized and destructed for each block. Definition at line 166 of file ScheduleDAGInstrs.h. Referenced by addPhysRegDeps(), and buildSchedGraph(). Definition at line 248 of file ScheduleDAGInstrs.h. Referenced by buildSchedGraph(), and llvm::GCNIterativeScheduler::detachSchedule(). Set of live physical registers for updating kill flags. Definition at line 251 of file ScheduleDAGInstrs.h. Definition at line 121 of file ScheduleDAGInstrs.h. Referenced by buildSchedGraph(), llvm::GCNIterativeScheduler::scheduleILP(), llvm::GCNIterativeScheduler::scheduleLegacyMaxOccupancy(), llvm::GCNIterativeScheduler::scheduleMinReg(), and llvm::GCNIterativeScheduler::tryMaximizeOccupancy(). 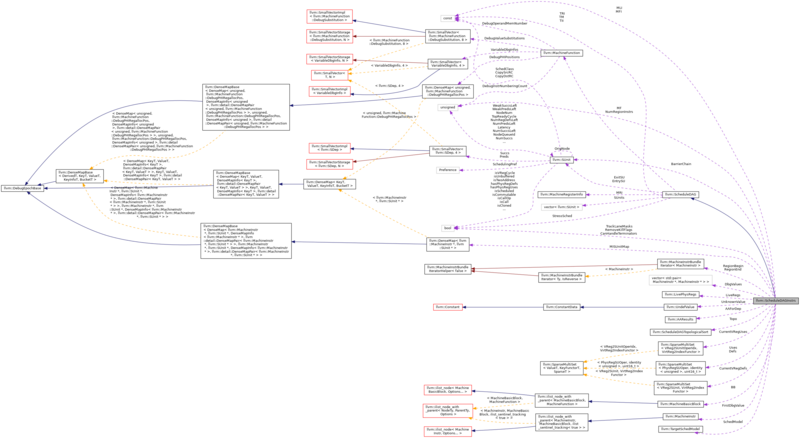 After calling BuildSchedGraph, each machine instruction in the current scheduling region is mapped to an SUnit. Definition at line 157 of file ScheduleDAGInstrs.h. Referenced by buildSchedGraph(), and initSUnits(). Definition at line 120 of file ScheduleDAGInstrs.h. Definition at line 153 of file ScheduleDAGInstrs.h. Referenced by enterRegion(), llvm::GCNScheduleDAGMILive::finalizeSchedule(), initSUnits(), and llvm::GCNScheduleDAGMILive::schedule(). Definition at line 147 of file ScheduleDAGInstrs.h. Referenced by buildSchedGraph(), enterRegion(), llvm::GCNScheduleDAGMILive::finalizeSchedule(), initSUnits(), llvm::GCNIterativeScheduler::OverrideLegacyStrategy::restoreOrder(), llvm::GCNIterativeScheduler::schedule(), llvm::GCNScheduleDAGMILive::schedule(), llvm::GCNIterativeScheduler::OverrideLegacyStrategy::schedule(), llvm::SIScheduleDAGMI::schedule(), and llvm::GCNIterativeScheduler::scheduleRegion(). Definition at line 150 of file ScheduleDAGInstrs.h. Referenced by addSchedBarrierDeps(), buildSchedGraph(), enterRegion(), llvm::GCNScheduleDAGMILive::finalizeSchedule(), initSUnits(), llvm::GCNIterativeScheduler::OverrideLegacyStrategy::restoreOrder(), llvm::GCNIterativeScheduler::schedule(), llvm::GCNScheduleDAGMILive::schedule(), llvm::GCNIterativeScheduler::OverrideLegacyStrategy::schedule(), and llvm::GCNIterativeScheduler::scheduleRegion(). True if the DAG builder should remove kill flags (in preparation for rescheduling). Definition at line 128 of file ScheduleDAGInstrs.h. TargetSchedModel provides an interface to the machine model. Definition at line 124 of file ScheduleDAGInstrs.h. Referenced by addPhysRegDataDeps(), addPhysRegDeps(), addVRegDefDeps(), initSUnits(), and ScheduleDAGInstrs(). Topo - A topological ordering for SUnits which permits fast IsReachable and similar queries. Definition at line 240 of file ScheduleDAGInstrs.h. Referenced by addEdge(), llvm::GCNIterativeScheduler::BuildDAG::BuildDAG(), buildSchedGraph(), canAddEdge(), and llvm::SIScheduleDAGMI::SIScheduleDAGMI(). Whether lane masks should get tracked. Definition at line 138 of file ScheduleDAGInstrs.h. For an unanalyzable memory access, this Value is used in maps. Definition at line 235 of file ScheduleDAGInstrs.h. Definition at line 167 of file ScheduleDAGInstrs.h. Referenced by addPhysRegDataDeps(), addPhysRegDeps(), addSchedBarrierDeps(), and buildSchedGraph().